Wow! What a flurry of activity since my last newsletter update. Nothing thrills my heart like providing a village or a school with a source of clean drinking water! So, let me start by sharing with you that on March 28, Grace and I and our Clean Water 4 Life drilling team, along with our visiting team of Daniel Lim, Hun Por Lim, Joseph Lee, participated in a celebration service at the Ando Elementery School. Click here to watch a short video of what took place. This video was provided to me from the Solomon Islands Broadcasting Corporation who broadcast this video on local TV and radio. Be sure to listen to the last 20 seconds to hear these school children sing! At this celebration service at Ando School, we heard from three village chiefs each representing their respective denomination of Baptists, Catholics, and Seventh Day Adventists. Each of these village Chiefs expressed how a 50 year problem of sourcing their water from streams and rivers, which meant walking one-way for an hour carrying the water, is now no longer being done since our Clean Water 4 Life ministry provided them water wells! It was an amazing moment for Grace and I. I was very blessed that our visiting team of Daniel Lim, Hun Por Lim, Joseph Lee were witnesses to see and hear the impact our ministry is having! I love how our water wells unite the different denominations to gather to sing and praise the name of Jesus! Both myself and Daniel Lim were able to share a very clear Gospel message during this celebration service. From March 22 - 28 our visiting team of Daniel Lim, Hun Por Lim, Joseph Lee traveled extensively with me on Malaita and on the Island of Guadalcanal. We walked long distances to get to rural villages, which meant walking through rivers on occasion! We journeyed from island to island and village to village in small outboard motor boats. We experienced what may be the bumpiest roads in the world. Everywhere we traveled, we witnessed Solomon Islanders in desperate need of a source of clean drinking water. We had numerous opportunities to pray for people, share with them the Word of God, and give them hope that we care about helping them obtain clean drinking water! God's timing is always perfect! Our 40 foot shipping container which left the USA on January 20th, arrived at Port Honiara on March 28th, which is the same day that our team left. During our March 22-28 travels, our Clean Water 4 Life team prepared the concrete pad at our base of operations and then on Thursday, April 4th, our shipping container was delivered and set in place. On Friday, April 5th, we began to unload our container which included our new tractor well drilling rig, and of course our vehicle, which was loaded with our personal living items. So please rejoice with us! It is wonderful to have our own car and our personal belongings! u. Other highlights include a surprise birthday party on April 2! Our Korean friends, Pastor Jaye Jang and his family, unexpectedly showed up with a birthday cake including candles! On Sunday March 31, I shared from God's Word at Bible Way Church about prayer birthing justice in the Solomon Islands! On Sunday morning April 7th, I shared God's Word at the Ando SSEC Church, calling them to walk worthy of their calling! I will finish by saying I have really enjoyed ministering to the YWAM DTS students! I was asked to teach on prayer and spiritual warfare every morning from 9 am - noon the week of April 1 - 5. In a few weeks, after these students finish their DTS, they are headed for outreach in Vanuatu! I thank God He has linked Grace and I with this YWAM Solomons base! Soon our CW4L ministry will partner with YWAM to provide a water well for Aruligo School located west of Honiara! The Principal came to the YWAM base seeking water for his 380 students. Our CW4L ministry said YES we will sponsor a water well and YWAM will provide a solar-powered water-pumping system! I am very excited to get them good clean drinking water, and then preach the Good News of Jesus Christ to these students and their families! I've said it before and I'll say it again, what we are doing together here in the Solomon Islands is truly historic! Without your prayers and partnership, none of this would be possible! God has called us to lead many in prayer and help bring justice to the poor. Over the next five years, we want to see YWAM missionary bases and 24/7 Houses of Prayer established in every province of the Solomon Islands. Our move also allows us to give hands-on leadership to our Clean Water 4 Life ministry. We believe everyone deserves a cup of clean drinking water and it is our desire to end the drinking water crisis in the Solomon Islands by installing 1,000 more water wells for those in need of clean drinking water. Already, our historic work has enabled 40,000 people to enjoy fresh, clean drinking water from our water-well ministry run by indigenous Solomon Islanders. It is our deep conviction that God will make a way for the remaining 300,000 Solomon Islanders to also enjoy clean drinking water. 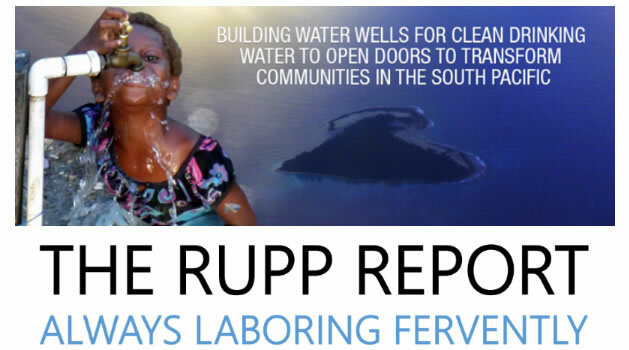 The cost for a water well for an entire village, a school, a church, or a clinic is $3,000 US. You can sponsor part of a well, the whole thing, or multiple wells! Online giving - Simply click HERE and fill out the form to make a one-time or recurring gift. Giving is done securely through the National Christian Foundation. Check - Make payable to "National Christian Foundation" and write "ID:1121806" in the memo. (This note in the memo field is very important so that the funds get credited to the Clean Water 4 Life account.) Mail to National Christian Foundation 11625 Rainwater Drive, Suite 500, Alpharetta, GA 30009. PayPal - Donations can be made to rickrupp@ihopkc.org. Choose the “No fee” option (i.e. Sending to a friend). Tax-deductible donations - We pay state and federal taxes, as well as 15.3% self-employment taxes on these donations. We also pay roughly a 7% processing fee to YWAM to cover the staff and infrastructure to process our donations. If you itemize your tax return or otherwise require a tax deduction, this is the option for you. Online Bill Pay - You may use your bank’s online bill pay option to have an amount automatically debited on a recurring schedule. Donations should be made to “Youth With A Mission” and sent to 4444 Edgar Park Avenue, El Paso, TX 79904. Designate the donation for us by putting “MS - Richard Rupp” in the Account field. Check - Make payable to “YWAM” and mail to 4444 Edgar Park Avenue, El Paso, TX 79904. Please include a separate note with “MS - Richard Rupp” on it to designate it to our account. Please do not include our names anywhere on the face of the check as that disqualifies it for a tax deductible receipt and it will be returned to you. YWAM website - You may also give online with at YWAM’s website using a debit/credit card or ACH withdrawal. Please note that we are charged a 4% fee for use of this service. Go to the YWAM El Paso-Juarez website at www.ywamepj.org and click on Donate in the upper right hand corner. Follow the directions at EasyTithe to complete your donation. Please be sure to include “Richard Rupp” in the comments to designate the donation. 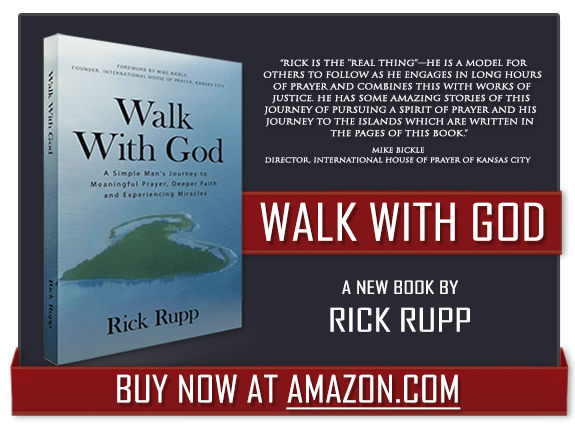 Two testimonies from those who have read my book: "I've known Rick for more than 15 years, and have prayed/walked with him through many of the miracles described here. He's the real deal, folks! By paying the price in the prayer room, he has emerged a marketplace prayer guy who listens carefully for God's Voice and then presses in until he sees the victory. You will be incredibly blessed by all these God stories. It's an easy read. Be prepared to be shocked and amazed at what you find in these pages, and allow it to build your faith so you can accomplish great things for the Kingdom." "Rick has been an elder at our church for years. We have watched & prayed with him about these trips (to the South Pacific). What miracles we have seen through him! God has done some amazing things through Rick's Yes!! Wow! We are blessed to call him our friend, and that we have been able to partner with him through this journey! I am so happy he has written these things in a book for everyone to enjoy and for them to see what God can do with our Yes!! Thanks Rick! We love you and love your book! What a blessing!"